Analytics help users get a handle on huge volumes of health care data. As the information age (1970 to the present) moves forward at a speed-of-light pace, three simple letters express a frequent lament among health care providers: TMI. Too much information, that is. Ever-increasing amounts of data are abundantly present in the health care sector, enormous data volumes from diverse sources. At different levels of the care continuum, the data overwhelm and the mind rebels. But data analytics are helping health care organizations put it all together. The results are improved operational efficiencies, increased collaboration among enterprise levels and departments, improved patient care, and reduced costs. Radiology is just one area within a health care system that is realizing the benefits. Data analytics have made the challenges of information overload less daunting. Tessa Cook, MD, PhD, an assistant professor of radiology at the Hospital of the University of Pennsylvania and a member of Radiology Today's editorial advisory board, describes the process as a "normalization" of data. Others call it democratization. Whatever term is used, data analytics (and the vendors developing the analysis tools) are making information more manageable. Of this new area, Sham Sokka, PhD, general manager of radiology and oncology solutions for Philips, says, "Analytical assets are driving the optimization of health care, which has not been as optimized as it should be." In health care, the main areas where data analytics come into play include patient care (aggregation of patient data) and operational metrics (business analytics). These two areas go hand in hand, as health care operations constantly feel pressures relating to cost control. As imaging is one of the most expensive components of patient care, diagnostic imaging activities assume a priority status. Cristine Kao, global director for healthcare information solutions at Carestream Health Partners, points out that there is a third area: the demand for overall system analytics. "This allows those at executive levels to better manage the entire environment to realize greater systemic performance," she says. As an example, Kao refers to the spring 2017 "ransomware" computer attacks that plagued 16 hospitals in Great Britain's National Health Service, among other entities. According to information from various cybersecurity firms, the recent outbreak was an attack on a global scale. The firms reported that there were tens of thousands of acts of computerized aggression in more than 60 countries. The list included the United States, but the US attacks weren't considered to be "widespread." Infection throughout the world included the health care industry, businesses, and government agencies. Assessing the magnitude of the attacks, Mikko Hypponen, chief research officer at F-Secure, an Helsinki-based cybersecurity firm, commented that the May 2017 occurrences amounted to "the biggest ransomware outbreak in history." In the future, executive-level data analysis users may be able to monitor and proactively address problems like these, Kao says. Data analytics also involve implications of government legislation. Sokka says the concerns form a triangle: "Professionals focus on optimizing costs, quality of care, and patient outcomes. It's a very finely tuned balancing act. If you spend money to improve quality, you improve outcomes, but costs go up. But you can't sacrifice quality for reduced costs so, to achieve balance, you need to analyze data for both the clinical and operational sides." Appropriate analytics can lead to benchmark creation, and benchmarks can be used to measure and monitor performance. Radiology in particular is placed under intense scrutiny to determine the impact on cost parameters. The purpose of analytics tools is to morph data into knowledge. Kao says raw data is ubiquitous. "For instance, just in radiology, you have the images, textual reports, scanned documents—different components from different systems. With data analytics, all of that becomes aggregated." Aggregated data are transformed into meaningful information, providing more context (eg, at the moment of need). "So if I am a radiologist, I have analysis that turns information into something more meaningful, in terms of insight and better decision making, in a measurable way. Thus, data analysis becomes a decision-making aid," Kao says. Data become knowledge by measuring the insight gained throughout the entire value chain. "But that's the tricky part—applying the knowledge most appropriately to day-to-day operations," Kao says. "Again, in radiology, it needs to be proactively applied to make the job faster and easier to help radiologists collaborate or communicate automatically with the appropriate stakeholders. That's how we see data analysis applied to each step of the journey in the radiology value chain." The result, she says, is that something that once seemed quite complex can now be pinpointed. She likens it to the mind's ability to concentrate. "It's getting rid of the noise to increase focus," Kao says. On the operational side of the enterprise, a user can apply an analytics dashboard to the imaging system to reduce wait times, unblock bottlenecks, measure compliance, improve patient satisfaction, reduce costs, and increase efficiencies—all of which affect the bottom line. With mountainous volumes of data, the inevitable question arises: How is all of this information best managed? It's an important question, as users need to know what they want to measure, how they are going to measure it, what benchmarks need to be set, and how to meet those goals. As many people in the health care realm are still learning how best to use data, it's important that they ask some very specific questions. Then, the answers will be revealed and, in almost organic fashion, the management of data will evolve. "As an example, one enterprise may ask itself, 'Do we need to buy a new CT scanner?'" Sokka says. "They need to look at their departmental throughput. Are they utilizing existing CT efficiently? Do they need more staff? As the answers can vary, the quality of information needs to be very good." Questioning leads to collaboration. "The users and the vendors are evolving together," Sokka says. "By knowing how they use the information and how the data [have] benefitted, we understand better how the information can be used in the most intelligent way." The questions that come from a specific site can indeed be very specific to the site's needs. Kent Thomas, vice president of solutions and business development for vRad, provides another example involving a potential CT scanner purchase. "Previously, a site may have used shooting-from-the-hip anecdotal information," Thomas says. "But data analytics illuminate how each CT scanner is performing, what type of imaging and/or interventional procedures are impacting each scanner, and whether the scanner is performing at capacity." Beyond just asking questions, a health care organization needs to take a "holistic" view, according to Cook, who is also director of the Center for Translational Imaging Informatics in the department of radiology at the University of Pennsylvania, an academic institution that has been involved with data analytics for two decades. The view would involve a long-term strategy, identification of areas where data analytics would prove most useful, integrating data analytics into the future, and alignment with all organizational components—operational, clinical, and technological. Vendors offering data analytic technology are invested in developing more advanced tools. This has led to the kind of collaboration that Carestream Health Partners recently undertook. In 2017, Carestream announced its partnership with Zebra Medical Vision, an arrangement established to provide imaging analytics that deliver automated population health insights and decision support tools to clinicians, payers, and providers. The relationship involves the addition of Zebra software to Carestream's Clinical Collaboration Platform. Both sides envision the integration will help clinicians better target conditions such as osteoporotic fractures, high coronary calcium levels, emphysema, and fatty liver tissue. Furthermore, the Zebra software will lend real-time assistance to radiologists for earlier detection, increased consistency, and avoidance of missed diagnoses. This is the partnership's version of the aforementioned holistic approach. Carestream's Clinical Collaboration Platform provides monitoring and analysis for business/operational system performance including proactive monitoring and preventive maintenance. Intelligent lesion management provides analysis that has proven to be faster and more consistent than manual comparison, according to the company. In addition, Carestream has a work in progress that it will unveil in the near future: a natural language processing program that will provide radiologists with real-time alerts that identify potential errors or discrepancies when they type or dictate reports. The program's semantic search capability will analyze the report context to provide conceptual data useful for clinical references, quality measures, research, business intelligence, and population management. One of Philips' latest offerings is its PerformanceBridge, which features an integrated dashboard for managing radiology departments from a single screen. The solution ensures that equipment is being properly utilized across modalities, and it provides integrated insights for patient dose management. "With PerformanceBridge technology, resources are better used in obtaining best outcomes," Sokka says. "In turn, we want to make sure the outcome is repeatable and consistent and reduces variability, so that every patient that comes in has a similar outcome. So we are using more and more data capabilities." PerformanceBridge runs on the HealthSuite framework, which uses machine learning functionality to build contextual predictive analytics and decision support algorithms. The solution also provides tools for workflow optimization, routine task automation, and communications coordination. Philips' Illumeo is an imaging and informatics technology that uses adaptive intelligence to enhance the way radiologists work with medical images. Through its Data Analytics Engine, the software provides the most relevant case-related information from various sources in one single view. Built-in intelligence records the radiologists' preferences and adapts the user interface to assist clinicians with tool sets and measurements driven by the understanding of the clinical context. Philips has also developed smart Imaging Data Analytics, powered by HealthSuite, which analyzes and assesses modality performance to anticipate service requirements before they occur. With the development, the company says it is moving away from a reactive service model to a proactive one. Potential problems are identified before they can occur. vRad's analytics enable organizations to compare their radiology management metrics with other hospitals or radiology groups. vRad's offerings are used by hospitals and health care systems seeking to better manage costs and improve operational efficiencies and radiology groups seeking to aggregate and normalize radiology benchmarking data, key components of demonstrating value in the evolving health care environment. "In radiology, we're just beginning to understand the impact of analytics," Thomas says. "Some of the components of our analytics engine allow us to better understand how radiology is being used, by identifying what is relevant in reports. For example, we can identify patterns and glean insights from positive findings, recommendations for additional imaging, and nonacute findings and determine how the report benefitted the referring physician. By analyzing the reports at this level, we can better understand how different referring physician groups use imaging. On an individual basis, it can be difficult to determine whether a physician is using imaging in an appropriate fashion. However, when looked at in the aggregate, it is highly accurate, and patterns emerge that, as a group, help affect changes in utilization. "Previously, all of this happened only by anecdote. It is now a more informed and organic process as to how it impacts patient care because the data inform how to utilize imaging more appropriately," Thomas says. Sokka says data analytics in health care, especially radiology, have been substantial. "Imaging is the largest spend as far as any kind of outpatient activity, and about $20 billion of that is what can be considered waste: unnecessary testing, repeat testing, low quality tests," he says. "We help users identify where the waste is [to help] solve that problem. So, we address the cost issue and, at the same time, help ensure that the right test is made at the right time with the right person. Those are keys for diagnosis. Another big part of that is reducing wait times, by reducing scan times and reducing unnecessary or repeat scans. That makes for a better patient experience." Quality of care and end-user productivity are the two main goals, Kao says. "Analytics is not an end result; it is a point in a journey," she says. Data analytics are a way to meet future needs in the present, Thomas says. "Many are now starting to learn how to use data analytics—how to use the information to shape a radiology service line or to continue to shape it," he adds. 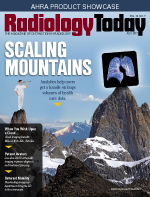 "As far as radiology, data analytics embraced properly by radiologists and the administration will bring radiology back front and center and give it an important voice in how health care is shaped." As for usage, Sokka says everyone is now on board: "Two years ago, we were selling to clinicians. We're now selling to operational people—COOs [chief operating officers], CFOs. That's a fundamental industry shift. We're now catering to professional management. It's a shift for us as well as the other vendors. Data analytics has become accessible to everyone."